The Journal of Industry and Innovation has announced a special issue on Innovation and Entrepreneurship in Academia. Guest editors are Erik E. Lehmann (University of Augsburg, Germany), Michele Meoli (University of Bergamo, Italy), Stefano Paleari (University of Bergamo, Italy), and Sarah A. E. Stockinger (University of Augsburg, Germany). Deadline for submission of full papers is on February 28 2019. Find the full call for papers here or on the journal’s website. This entry was posted in uncategorized and tagged cfp: call for papers, entrepreneurial university, special issue on 3. September 2018 by Fabian Hattke. 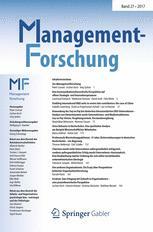 Our study on scholars’ attitudes towards academic journals’ peer-review has been published by Managementforschung (MF). Here’s the abstract: Peer review in academic publishing relies on the voluntary engagement of scholars who are, at best, committed to that practice. Current debates on peer review suggest that this commitment is diminishing. Conceptualizing peer review as an instance of social exchange allows us to propose a conceptual model of commitment to peer review and test it by means of a structural equation analysis. Our empirical study is based on survey data from the social sciences (n = 359). Results show that authors are more committed to the practice of peer review if reviewers base their recommendations on rational arguments so that authors can trust them for their competence. By contrast, benevolent reviewers who try to collaborate with authors are not effective in fostering trust and commitment. Within the limitations of our data and with regard to reviewers’ behaviors and characteristics, we cannot support sweeping criticisms of the operational reliability of academic journals. Access the article here: Hattke, F., Bögner, I., & Vogel, R. (in press): (Why) Do You Trust Your Reviewers? Influence Behaviors, Trustworthiness, and Commitment to Peer Review. Managementforschung (MF), 1-26. This entry was posted in uncategorized and tagged peer review, publication, research on 3. June 2018 by Fabian Hattke. European Review, the journal of the Academia Europaea, just published our article “Governing Collective Action – the Impetus for University Commons”. The Academia Europaea is a European, non-governmental association acting as an academy. Together with the INCHER at Kassel and the Volkswagen Foundation, the Academia Europaea organized a conference on university governance in Hannover in 2016. European Review now published a special issue with all contributions. Our article discusses how different modes of governance facilitate or obstruct collective action in universities. Based on theories of public goods and the resource-based perspective, we develop the concept of university commons in order to analyse the challenges arising from the governance of collective action. We examine how to effectively balance collegial and managerial governance to create a sustainable portfolio of university commons. Frost, J. & Hattke, F. (2018): Governing Collective Action – the Impetus for University Commons. In: European Review 26(S1), 70-84. This entry was posted in uncategorized and tagged conference, higher education, publication, research, university governance on 25. February 2018 by Fabian Hattke. The XVI International Triple Helix Conference invites proposals for oral presentations, special panel sessions, and posters. The conference will be held in Manchester (UK) on September 5-8 2018. The main theme is “The Triple Helix and Beyond – a New Era”. The conference includes topics such as geographical and sectoral dimensions of the triple helix, policy and governance of the triple helix, the triple helix in transition and emerging economies, socially responsible innovation and the quadruple helix, micro foundations of the triple helix: New actors, relationships, and business models. Submission deadline is on Friday 2nd March 2018, decisions will be available in April 2018. Find the full call for submissions here. This entry was posted in uncategorized and tagged cfp: call for papers, conference on 24. January 2018 by Fabian Hattke. Congratulations to our former RePort team member Ferdinand Wenzlaff who successfully completed his PhD at Leuphana University Lüneburg under supervision of Professor Markus Reihlen. We whish you all the best for your future career, Ferdinand! This entry was posted in uncategorized and tagged project administration, research on 24. January 2018 by Fabian Hattke. The German management journal BFUP – Betriebswirtschaftliche Forschung und Praxis published our qualitative study on university governance. The paper details several mediating tactics of university leaders trying to balance competing and contradictory claims of different stakeholders. Here’s the abstract in English: A central aim of reform aspirations in the higher education sector is to strengthen universities’ capacity to act strategically. Universities receive more institutional autonomy, but have to operationalize and quantify their strategies in target agreements with their federal states. For that reason, many Landeshochschulgesetze (LHG) provide increased control power for the top management of universities. At the same time participative rights of decision for the different academic committees are an integral part of the LHG. Thus, different and contradictory leadership requirements coexist. These contradictory leadership requirements impair top managements’ ability to act strategically. The aim of this article is, firstly, to analyze these contradictions and, secondly, to work out which room for maneuver exists for the governance in universities and how it can be used. We use qualitative Interviews with university top management members to illustrate which tactics they can use to mediate between the contradictory leadership requirements in order to implement strategies. Access the study here: Woiwode, H., Frost, J. & Hattke, F. (2017): Hochschulleitungen zwischen Repräsentation und Ergebnisorientierung – Handlungs(un)fähigkeiten und Vermittlungstaktiken. In: BFuP – Betriebswirtschaftliche Forschung und Praxis 69(6), 633-652. This entry was posted in uncategorized and tagged leadership, publication, research, university governance on 28. December 2017 by Fabian Hattke. Our study “How is the Use of Performance Information Related to Performance of Public Sector Professionals? Evidence from the Field of Academic Research” has just been published in Public Performance & Management Review. In the article, we assert that there is inconclusive evidence as to how performance management is actually related to performance, particularly in subfields of the public sector where professional work prevails. We propose that the association between the use of performance information and performance of public sector professionals varies with the targets of management control. We test our hypotheses in the field of academic research, a prime example of professionalism in the public sector. The overall results of an online survey with 1,976 observations suggest that performance management is positively related to publication performance when performance information is used for the control of input targets. In contrast, we find negative associations of performance information with performance when used to control output targets. Public managers in professional fields should consider these countervailing relationships when they compose and use control systems. Access the study here: Vogel, R. & Hattke, F. (2017): How Is the Use of Performance Information Related to Performance of Public Sector Professionals? Evidence from the Field of Academic Research. In: Public Performance & Management Review, 1-26. This entry was posted in uncategorized and tagged control mechanisms, performance, publications, research on 4. December 2017 by Fabian Hattke. Attached, you’ll find the call for papers for the upcoming workshop of the VHB WK HSM. Prof. Dr. Joachim Prinz and his team will welcome you on February 15-16, 2018 in Duisburg. The workshop covers all issues releated to higher education management, in particular pay for performance and rankings, accreditations, third party funding, career development and personnel training, quality management, peer review, and digitalization. The deadline for short papers (max. 1000 words) is on December 23. Find the call for papers with all information here (only in German). This entry was posted in uncategorized and tagged cfp: call for papers, conference on 22. November 2017 by Fabian Hattke. The University of Augsburg in Germany invites us to a cutting-edge conference on Higher Education in Modern Ecosystems: Efficiency, Society and Policies. Keynote Speakers will be Tommaso Agasisti (Politecnico Milano, Italy), Stefano Paleari (University of Bergamo, Italy) and Berthold U. Wigger (Karlsruhe Institute of Technology, Germany). Please read the full CfP here. This entry was posted in uncategorized and tagged cfp: call for papers, conference on 26. October 2017 by Rick Vogel. A little more than three years ago, we’ve started the IndiKon. As the generous funding from the Federal Ministry of Education and Research (BMBF) for our project terminates this October, some of our colleagues in Hamburg and Friedrichshafen move on to new professional challenges. After obtaining her PhD, Jessica leaves for the university hospital in Kiel. Hendrik continues his research at the Wissenschaftszentrum Berlin für Sozialforschung (WZB). And Isabel works at the Chair of Management, especially Strategy and Leadership at Constance University. It’s been a wonderful time with you and we wish you all the best in your future endeavors! This entry was posted in uncategorized and tagged project administration on 20. October 2017 by Fabian Hattke. We are very happy to anounce that IndiKon team member Jessica Petersen successfully completed her PhD thesis with the defense. The Hamburg-based IndiKon team members and other colleagues enjoyed an amazing and very interesting presentation about “Evaluation of innovation performance in research: Between output and peer control”. Jessica even inspired the part of the audience that was not connected to the research topic before. Congratulations and all the best for the future career, Jessica!!! This entry was posted in uncategorized and tagged PhD defense presentation on 12. September 2017 by Hendrik Woiwode. This year’s EFMD Higher Education research conference will take place on 23-24 October 2017 in Leuven, Belgium. It will be hosted by KU Leuven. Outline papers can be submitted until 30 April 2017. Fur further informations take a look at the HERC2017_Call_4_Papers. This entry was posted in uncategorized and tagged cfp: call for papers, conference, higher education on 24. April 2017 by Hendrik Woiwode.